MELEM is manufactured by NEVA, d.o.o....(d.o.o. is Croatian for a corporation). It is located at Obrtnicka 37, Rakitje 10 437 Bestovje, Croatia and is a part of the holding company, Atlantic Grupa, located in Zagreb, Croatia. NEVA WAS FOUNDED IN 1918 as a pharmaceutical laboratory called RAVE. In 1930 RAVE began manufacturing cosmetics and pharmaceuticals. In 1947, RAVE merged with the Croatian affiliate of Beirsdorf AG and became NEVA.It was a contract manufacturer tor L'Oreal, Odol, Helena Winterstein, Sara Lee, Woltz, and others. In 1978, NEVA was bought by PLIVA, a large pharmaceutical manufacturer with great reputation for developing products sold world wide. In 2003, NEVA became a part of Atlantic Grupa and a new, cutting edge factory was opened in 2009. ﻿Melem USA imports, distributes and sells only Melem (also known as Zagrebacka Melem) manufactured by Neva, d.o.o. in Zagreb, Croatia and maintains a formal contract with Neva to import Melem to the US and to sell in the US, Canada, and Caribbean. We as e commerce retailers based in the US are subject to be in compliance with US Federal Trade Commission and US Food and Drug Administration regulations regarding advertising,labeling, fair trade practices, and cosmetic safety. Other countries may not have the same requirements or have their e commerce policies regulated and enforced as does either the EU or the US. Our labeling and trade practices are a little different than the European Union (Melem is manufactured in Croatia, a member of the EU) which accounts for subtle differences and a special label compliant with US requirements. The brand name and logo are internationally copyrighted. Melem USA LLC imports directly from Neva via their holding company, Atlanticgrupa, also based in Zagreb. All packages other than Amazon orders will be delivered with a return address of our Winter Park office...PO Box 146, Winter Park, CO 80482 Amazon handles its own shipping of Melem from their warehouses. Melem USA imports and sells only Melem (also known as Zagrebacka Melem) manufactured by Neva, d.o.o. in Zagreb, Croatia. The US Food and Drug Administration is the government body which sets and enforces standards for food, drugs and cosmetics sold in the USA for cosmetics packaging and required information and defines what is a cosmetic. Melem is a cosmetic, and not a drug. The FDA does not require expiration dates on cosmetics. However, the European Union does and those dates will appear on EU manufactured cosmetics. Melem is manufactured in an EU country. For US customers, to determine the expiration date, look at the batch number on the outer package. It contains the date of manufacture stamped below the US UPC code (you use for scanning). The last 4 digits are the manufacture date: 0315 means March 2015. 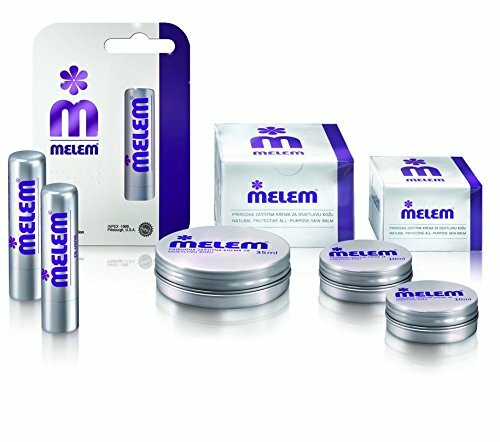 The shelf life of Melem is 6 years as certified by the manufacturer NEVA so that means the product expires in 2021. NEVA itself stamps all of its products, including Melem, sold in the EU with a 2 year expiry date, though the actual expiry length for Melem is 6 years. Atlantic Grupa is the Neva holding company that is engaged in marketing and export with whom Melem USA works to import it to the US. Copyright MELEMUSA.LLC; all rights reserved.